Aliases: Mr. Umbala, "Lord of the Veldt", "Liege of the King of Beasts", Lion Lord, Avenger of Wrongs, Scarlet Lady, Eye of Ra, She Who is Powerful, Sachmet, Sakhet, Sacmis, Hathor, House of Horus, "Mistress of Heaven", "Lady of the Stars", "Celestial Cow"
Powers/Abilities: Sekhmet possesses the conventional superhuman abilities of the Ennead including superhuman strength (Class 75), endurance, reflexes, resistance to conventional disease and injury and regenerative capabilities. She is easily distracted by her uncontrollable bloodlust. As Hathor she possesses reduced strength (lifting 25 tons), but otherwise has the same abilities as Sekhmet, though instead of bloodlust she is controlled by lust of amorous nature. In Sekhmet's male Lion God form he required a human host, transforming it into a replica of his own form. He has a number of other powers, some of which he has demonstrated. He can grow in size, move at rapid speeds, teleport himself and others, and alter his own density. He possesses superhuman strength (lifting 25 tons) and durability, and presumably is immune to the effects of aging and disease. He can manipulate others, whipping them into a mob-like frenzy, or causing his foes to obey him. His most powerful weapon was his totem-stick, which proved powerful enough to drop Iron Man or Thor with a touch, or a blast. The totem-stick can also summon lions, which he can control. After the totem-stick was destroyed, he used a spear. (Egyptian Myth) - Seduced by her uncle Ammon Ra Nut gave birth to Hathor, goddess of love and music. (Avengers: Roll Call - Sekhmet profile/Myth) - In ancient times Hathor partially raised and later married her great-grandnephew Horus. When the people of Egypt rebelled against her father Ammon Ra, he claimed the Egyptians plotted against him, so he goaded gentle Hathor into punishing humanity. Her bloodlust transformed her into the violent Sekhmet. (All-New Official Handbook of the Marvel Universe Update#4/Myth) - Sekhmet released such fury against her mortal foes that Ra feared she would destroy the human race. (Avengers: Roll Call - Sekhmet profile/Myth) - Ra tricked her into drinking 7000 jars of red-dyed beer. Inebriated, Sekhmet lost consciousness and awoke the next morning as Hathor. (Legion of Monsters: Satana#1 (fb) - BTS) - To prevent another transformation into Sekhmet, Ra fashioned the Orb of Ra from Hathor's right eye. (Avengers: Roll Call - Sekhmet profile/Myth) - Overcome by bloodlust, Hathor became Sekhmet again. (All-New Official Handbook of the Marvel Universe Update#4/Myth) - The siblings Sekhmet and Bast were feline war gods with male and female forms ruling over Upper and Lower Egypt. Bast fled when the pharaohs rose to power and Sekhmet absorbed her sister's power base Lower Egypt. Moving her sect to Memphis, Sekhmet protected the pharaohs in battle. (All-New Official Handbook of the Marvel Universe Update#4/Myth) - After the times of the pharaohs Sekhmet only had a fringe cult and became jealous of Bast, who had become the Panther God of the powerful nation Wakanda. (Thor I#301 (fb) - BTS/Avengers: Roll Call - Sekhmet profile) - Circa 1000 AD, Hathor joined Earth goddess Gaea in gathering humans representing mankind's highest ideals as a peaceful appeasement for the cosmic Celestials' judgment of Earth. (Astonishing Tales: Dominic Fortune#5 (fb) - BTS) - <1937> The Lion Cult had grown into a threat in the Wakandan nation. (Astonishing Tales: Dominic Fortune#5 - BTS) - <1937> T'Chaka's adopted son led the foreigners Dominic Fortune and Amanda MacLain into a trap by the Sekhmet worshipping Lion Cult. (Astonishing Tales: Dominic Fortune#6 - BTS) - T'Chaka saved Fortune and MacLain from the Lion Cult. (Avengers I#112) - An African tribe welcomed the journalist known only an Umbala to observe their ritual worship of the Lion God. Umbala was loving it, until N'Laka revealed that they needed a human sacrifice for their lord to return--and it was Umbala. The Lion God took possession of Umbala's form and led a group of African-Americans to assault Avengers Mansion, under the pretense of demanding that the Black Panther return to Wakanda. Upon gaining entrance to the mansion, "Umbala" took mental control of the Black Panther, revealed himself as the Lion God, and teleported away with T'Challa. He attempted to force the Panther to reveal how the Panther God could maintain his followers without appearing to them. The Panther refused, and so the Lion God sought to force him by threatening his team-mates. He returned to the mansion and overpowered the Avengers, but Thor recovered quickly and summoned down a lightning bolt, which seemingly destroyed him. In reality, the Lion God survived (although his totem-stick was destroyed) and relocated to a cavern beneath the mansion, from which he planned to make another assault. (Heroic Age: Prince of Power#2 (fb) - BTS) - Lion God somehow escaped the cylinder and conquered Duat as Sekhmet. She enslaved Apep in the process. (Black Panther V#2-3 - BTS) - Lion God cultists summoned Morlun to Wakanda to slay the Black Panther (T'Challa). (Heroic Age: Prince of Power#2 (fb) - BTS) - The Council of Godheads warned her of the imminent arrival of Amadeus Cho, who sought to steal the Book of Toth, to stop the Asgardian Vali Halfling from gaining it and becoming omnipotent. (Heroic Age: Prince of Power#2) - Amadeus Cho and his new ally Thor arrived in Duat and Sekhmet and Apep were already waiting for them. (Heroic Age: Prince of Power#3) - Sekhmet and her slave Apep attacked Thor and Amadeus Cho, but they managed to escaped her for a moment when Cho distracted her with a heart from the Court of Anubis. Sekhmet couldn't resist her bloodlust and jumped at the heart. They took Ra's funeral barge to escape them, but Sekhmet quicky caught up with them, riding on the serpentine Apep. Thor used Mjolnir to break the wall to the Egyptian land of the dead and he and Cho entered it. Passing thousands of human-sized clay figurines Thor and Cho soon had to face the out-of-control Sekhmet. While Cho kept searching for the Nefer-Ka-Ptah's house where the Book of Thoth was kept, Thor fought Sekhmet. She kept coming back and Cho came up with a plan to stop her without fighting. Mixing beer and weeds from the salt marsh Cho created with a little energy burst a drug to calm her down and force her transformation back into Hathor. 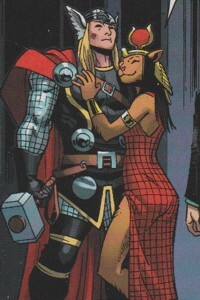 Thor considered this tactic dishonorable and could hardly get the lovelorn, purring Hathor off of him. Despite landing in the right house and breaking through the energy shield they still failed, inadvertently aiding Vali by desroying the shield in Duat, and enabling him to steal in in the real world. In her drugged state Hathor didn't care and just wanted kisses. 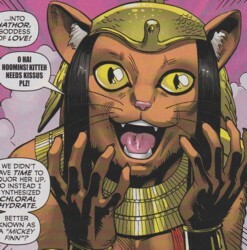 (Heroic Age: Prince of Power#4) - The drug wore off and Hathor became Sekhmet again. When Vali was teleported to Duat as punishment for reading from the Book of Thoth she immediately attacked him. Comments: Created by Steve Engelhart and Don Heck. "Since the Liongod's weapon/staff wasn't shown to be with him when he was sent to the other dimension, I had Sal draw the weapon in issue 41 of BP, page 10, panel 1 on the left side near Malice's spear and T'Chaka's shield in T'Challa's trophy room. Other artifacts (of obscure charcters) in this room, as shown in this issue and issue 23, page 12(? 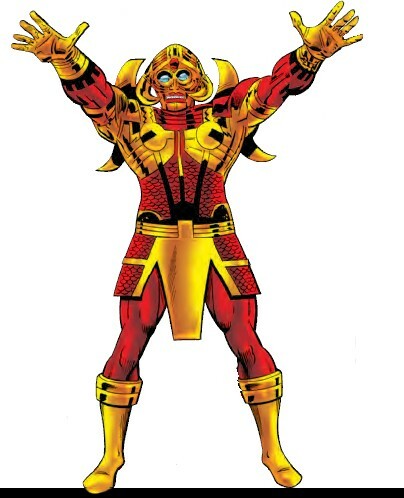 ), are King Kadaver's gold medallion (taken after a dino stepped on him), the Throb vibranium robot and Malice's spear." In the Hyborian Era, Amra was legendary warrior, named as a translation of "The Lion," and living in the Black Coast of what is now Africa. I believe Amra was actually a succession of warriors. Conan himself was believed by many to be Amra. It's possible that the Lion God's worship extends back to 10,000 BC or before. It strikes me that "Amra" might be the Kushitic pronounciation of "Amun-Ra." If this was the case, the latter was probably a Stygian deity who wound up being consolidated with Apedemekar (quite possibly, the patron god of Hyborian-era Meroe), by his Kushite worshippers. That would be comparable to how Osiris and Apis--the sacred bull of Memphis--were consolidated by the ancient Egyptians as "Serapis." Furthermore; the warrior(s) known as Amra might have been the mortal avatar(s) of the Lion God. Similar to how Sigmund and Sigfried--of the Volsung Saga--were (allegedly) mortal avatars of everyone's favorite Asgardian Avenger. Given the temporary "occupation" of Mr. N'Laka, this latter hypothesis is not as far-fetched as one might initially think. WHO IS THE LION GOD? Ask our myth-experts and watch 'em duke it out! "The Lion God is either a superhuman or a god that Marvel made up (such as Caber or the Enchantress). There is an Egyptian lion goddess named Sekmeht (Daughter of Bast), and the Incans had a jaguar god, and Hercules wore the pelt of the Nemean Lion, but as far as I've seen already, there is no African lion god." Christopher Priest named the Panther God as Bast, who was an Egyptian Cat God. BTW-Priest's a helluva writer...go buy the Black Panther, and tell everyone else you know to do the same! This would make naming the Lion God/Goddess as Sekmeht, Bast's son/daughter an easy explanation--Snood. "Apedemak the Lion God was worshiped by the peoples of Meroe and Nubia. While most of Meroe's gods were definitely borrowed from Egypt's pantheon, Apedemak is distinctly African and seperate from guys like Osiris, Isis, and Hathor. Generally depicted as a man with a lion's head and bearing a scepter with a seated lion surmounting it, Apedemak had a vast temple complex that devotees made pilgrimages to at Musawwarat es-Sufra amongst the sands of the Butana north of the Nile's sixth cataract . Mention of him in lower Nubia is rare but in at least one temple to Isis, Meroitic ruler Adikhalamani was referred to as "beloved of Apedemak". The height of Apedemak's worship was from around 800 to 200 BC." William: "As far as Apedemak, he's a war-god who wore the skin of a lion as a symbol as his strength. You could parallel him with Anubis, the Egyptian funeral god who was called the jackal god. Neither of them were gods of these animals, but they took on their images as icons as Artemis took the deer, Cernunnos the stag, Vishnu the cobra and Apollo the crow. The Egyptian, African and Native American gods were more into this animism than anyone else." Greg O: "...I am simply an armchair mythologist, but until such time as I find other references to the contrary, we will have to agree to disagree. Apedemak could certainly have been depicted as anthropomorphic and wearing a lion's skin as I know of a pseudo-Egyptian/Nubian antelope god that is similarly adorned. However the resource I am referencing lists him as anthropomorphic to the shoulders with a lion's head and as a war-god of the Sudanese culture of Meroe, and in keeping with the lion/conqueror/pharaoh iconography of the Egyptians rather than a funerary deity like Anubis. Having an animal's head might not make you the god of that particular animal but this is comic books and there are no hard and fast rules. Zeus was the storm/thunder god of the Greeks but he had many other aspects as most gods tend to. I'd say Apedemak qualifies as a lion god. But if Apedemak doesn't fit the bill in your book - - though he IS associated with lions and in at least one instance depicted with a lion's head and not merely garbed in its skin - - you can also pick from (though ALL have a less African flavor than Apedemak, maybe these deities went scouting for worshipers elsewhere in Africa as so much of the Egyptian people's faiths are spoken for) Mihos, referred to as a lion-god and the son of Bastet, known as Miysis to the Greeks, and with shrines to him at both Bubastis (his mother's center of power) and at Leontoplis, his own center of power, OR the Lion-God listed as one of the aspects/faces of Amun-Ra in the Papyrus of Nesi-Khensu. Or even the Twin Lion-Gods sometimes seen as incarnations of Shu and Tefnut or the other (or perhaps the same)Twin Lion-Gods Sef (Today) and Tuau (Yesterday). Any or all of these deities might deserve a mention on the Lion-God's profile. If the Panther God of Wakanda, a distinctly African nation, is the distinctly Egyptian deity Bast, I see no reason why this could not be the case with other lion-like Egyptian deities and other African locales." The true identity of the Lion God was revealed in the Council of Godheads entry in OHotMU 2006#3 as the Egyptian god Sekhmet. In the same entry the Panther God was confirmed as Bast (which was already stated before by Christopher Priest). anyway...these stories were not Engelhart's finest work. The best part of these stories was the introduction of Mantis, especially when she revealed she was more than just some kung-fu chick by dropping Thor with a single blow. Veldt, also spelled veld, means a grassland, esp. of Southern Africa, usually with scattered shrubs and trees. Also, in Avengers Annual 1999, the play "The Lion God" was showing around Broadway, I believe. Lion God received a small entry in All-New OHotMU Update#4 and a bigger one as Sekhmet in Avengers: Roll Call. Heroic Age and handbook info added by Markus Raymond (and a bunch of images too). N'Laka was the leader of the African tribe that worshipped the Lion God. He arranged the capture and possession of Umbala. Mr. Umbala was a journalist who was possessed by the Lion God. He apparently was released after the Lion God's initial defeat.